Have you heard of Vesper Sock Yarn? This stuff is so hard to get! 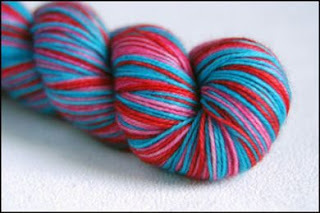 I emailed Julia, and asked (okay, more like begged) for a skein of Love Stinks. It was just my luck that she had dyed some that day, and because she's also a part of Sockapalooza, she would put one aside for me. Hooray! Today was such a beautiful day. It was so warm that the kids played water guns with Daddy. I'm finding it so hard to get any homeschooling done; all I want to do is go out and enjoy the weather! Nice picks! Congrats on the Vesper. Sounds like a good day!